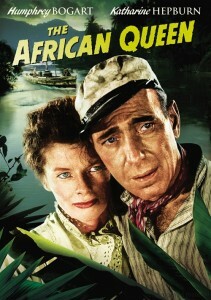 Production superlatives abound in the great romantic adventure The African Queen: Adapted from the 1935 novel by C.S. 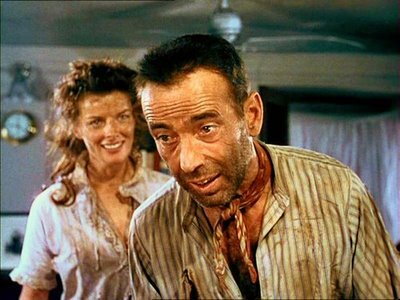 Forester by legendary writer/critic James Agee, directed by John Huston, produced by Sam Spiegel, photographed by the great Jack Cardiff and starring an Oscar-winning Humphrey Bogart and Katherine Hepburn, the film remains an American classic, and an outstanding example of first-rate Hollywood filmmaking created on location and away from the physical oversight and comfort of the studio. It was shot primarily on location in Africa and England and it looks and feels that way from the very first shot. Paramount also commissioned a new documentary about the film, the hour-long Embracing Chaos: The Making of the African Queen. Produced by Nicholas Meyer and directed by Eric Young, it’s an excellent companion piece to the film that includes more than two dozen newly recorded interviews with everyone from surviving cast and crew members (Theodore Bikel and assistant director Guy Hamilton), critics, biographers, publicists, relatives and diehard fans like Martin Scorsese (whose appearances on classic DVD supplements are fast becoming a second occupation for him). The tales of the movie’s creation–involving everything from soldier ants to rubber leeches to Hepburn’s constant vomiting between takes to Huston’s desire to shoot an elephant—have long been considered some of Hollywood’s greatest production tales. Commemorative edition DVD and Blu-ray box sets of the film are also available, priced at $34.99 and $43.99, respectively. They include an audio disc of a Lux Radio Theater African Queen broadcast, collectible film frames and postcards, and a reproduction of Hepburn’s out-of-print memoir The African Queen or How I Went to Africa with Bogart, Bacall and Huston and Almost Lost My Mind. One of my favorite Bogart flicks… glad they did it justice!